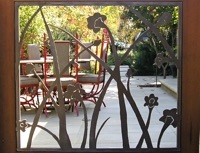 Late Afternoon Garden Design creates beautiful gardens that are truly at home in their environment. Cultural and personal histories, environmental concerns, and a sense of place are woven into a coherent narrative that celebrate not only the beauty of our homes but further our connection to the landscape. The site-specific nature of each garden is balanced with the architecture of the home to seamlessly express the client’s desires and lifestyle. 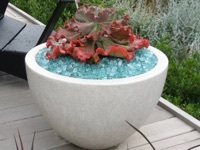 We work with clean simple forms, softening and blurring them with generous layers of planting. 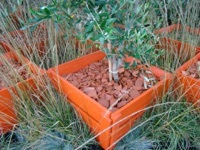 Native and adaptive plants, local materials and wildlife attracting practices are incorporated in a stylish and functional manner. We work in a collaborative manner, involving and engaging the client and project team to turn vision into reality. The site, the client, and our talents come together to create the best possible project. Late Afternoon Garden Design, a garden and landscape design firm in Ukiah, California, serving Northern California and the Bay Area. Design principle Nicholas Thayer has assisted numerous architects, contractors, and homeowners, including Michelle Kaufmann, Sam Sinnott, and Scott Prentice. 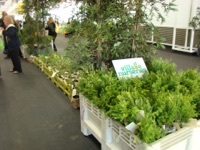 The mkLotus show house at West Coast Green and The Late Show Gardens are among their most recent show gardens. Late Afternoon Garden Design, a garden and landscape design firm in Ukiah, California, serving Northern California and the Bay Area. Design principle Nicholas Thayer has assisted numerous architects, contractors, and homeowners, including Michelle Kaufmann, Sam Sinnott, and Scott Prentice. 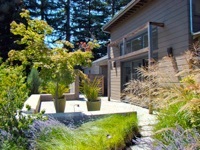 The mkLotus show house at West Coast Green and The Late Show Gardens are among their most recent show gardens. 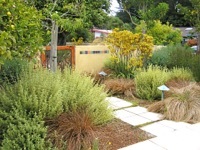 Late Afternoon Garden Design serves Menlo Park, Atherton, Woodside, Portola Valley, Palo Alto, Los Altos, Healdsburg, Napa, St Helena, Calistoga, Mendocino, Fort Bragg, and Ukiah. © 1996-2017 Late Afternoon Garden Design, Nicholas Thayer. All rights reserved.